Bearded dragons are big fans of insects, in fact, they would eat them all day long if they could. However, they can only eat insects that have been specially bred to be fed to reptiles. These can be purchased from good pet stores or online from specialist sites. Wild insects should not be fed to captive bearded dragons as there is no knowing what parasites they may be containing. Bred insects can also be gut loaded with other foods that are good for bearded dragons so that the beardie gets a good dose of nutrients that are beneficial for them. This is a good way of feeding them veggies and fruits that they may not be that keen on eating if they were fed them individually. All you need to do is to put the veggie or fruit in the tub of insects and wait for them to consume it. Once it has been consumed sufficiently, the insects can then be fed to a bearded dragon. Don’t feed them all at once. Do also be aware that not all insects are the same and some are actually bad for a bearded dragon. So what insects can bearded dragons actually consume? Can bearded dragons eat dog food at all? Unfortunately, they cant at all. Dogs have food that is specially designed for their nutritional needs and does not suit those of a bearded dragon. A food to avoid. For more foods that bearded dragons can and can’t eat, check out our bearded dragon food list. Can bearded dragons eat daffodils? Daffodils have the latin name Narcissus and are grown from bulbs. They have a typical flowering time of between February to early May and are usually panted between September to October. They grow up to 5cm and spread to 50cm. They enjoy sun or light shade and are mostly fully hardy. Unfortunately, they cant at all, as they cant eat any wildflower due to the risk of them carrying pesticides or parasites. A food to avoid. Can bearded dragons and frogs live together? In this post, we look at the subject of whether bearded dragons and frogs could possibly live together. It may be the case that an owner may keep both frogs and beardies in the same house, and so this is a pertinent subject. It’s not a good idea to put them together. The bearded dragon will literally eat it alive. Frogs also contain parasites that may harm a captive bearded dragon and if the beardie decides to eat the frogs then it could find itself unwell as a result. So it is best for bearded dragons and frogs to steer clear of each other. It isn’t a good idea to even feed frogs to the bearded dragon for this very reason. Can bearded dragons and cats get along? For the most part, it’s not a good idea to have the bearded dragon and the cat hang out together. There is far too much potential for unforeseen accidents. However, lots of cat owners also have bearded dragons and they just keep the bearded dragon away in the vivarium and keep it sealed. Some braver owners have got the two animals tamed enough to hang out together but this is not recommended if you’re not an experienced owner. It’s always good to be there to supervise them in this situation and make sure that both animals are safe in their own way. Can bearded dragons eat freeze dried mealworms? Can bearded dragons eat freeze dried mealworms? 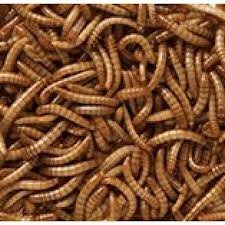 Freeze dried mealworms are protein filled insects that are bred especially as predator food. They can often be loaded up with other foods to enhance their nutritional value. They are then dried using a freezing process so as to ensure the optimum nutritional value is preserved. Unfortunately, even though they absolutely love them, mealworms are a very occasional treat for bearded dragons as they have hard shells that they find difficult to digest so are a food to avoid feeding them. Can bearded dragons and chameleons live together? Can bearded dragons and chameleons live together? Bearded dragons and Chameleons are quite similar reptiles who come from very different parts of the world. They also eat very similar foods and so it is easy to understand why they might be considered to share a vivarium. So can bearded dragons and chameleons live together? It’s not a good idea to put them together. It’s highly likely that the bearded dragon will look to attack it and eat it, especially if it is larger than the chameleon. Chameleons are very supple creatures and will feel threatened to be in the same vicinity as a bearded dragon. The situation may also cause both creatures to become sick. They are best kept in separate vivariums where they can enjoy their own environment. Can bearded dragons and uromastyx live together? Can bearded dragons and Uromastyx live together? Uromastyx is a genus of African and Asian agamid lizards, the member species of which are commonly called spiny-tailed lizards, uromastyces, mastigures, or dabb lizards. Lizards in the genus Uromastyx are primarily herbivorous, but occasionally eat insects and other small animals, especially young lizards. They spend most of their waking hours basking in the sun, hiding in underground chambers at daytime or when danger appears. Their spiked tail is muscular and heavy and can be swung at an attacker with great velocity, usually accompanied by hissing and an open-mouthed display of (small) teeth. They can’t unfortunately. There is a big risk that once the bearded dragon grows larger than the Uromastyx, it will look to eat it. At the same time, the Uromastyx also has a very heavy tail that could possibly injure a bearded dragon. They are better off being kept away from each other in different vivariums where they can enjoy their own environments. It is a far less stressful situation for both creatures and one that they will enjoy more. Do bearded dragons and dogs get along? Do bearded dragons and dogs get along? Dogs are extremely popular pets and owned the world over by humans. So there is the possibility that owners may have a bearded dragon as a pet as well. If this is the case…. If a bearded dragon and a dog live in the same household they the bearded dragon needs to be kept in its habitation when a dog is in the vicinity. They should never be allowed to be let out and to roam in a room when a dog is in the same room. Keep a bearded dragon safely in its vivarium. Even if you are sure that the dog wouldn’t harm the bearded dragon, they can have a hint of unpredictability and may run and jump on it. Bearded dragons are ectotherms. This means that they need external heat sources to warm their bodies This means that they have the opportunity to thermo-regulate. Thermo-regulation means that the lizard can move between areas of differing temperatures so as to regulate their own internal temperature. What space does a bearded dragon need? Bearded dragons can be kept on their own or in sexual pairs. They can also be kept in groups that contain a male with two or more females. If the enclose is quite big, and it contains numerous hiding places and places for them to bask, then two males and multiple females can be put together. However, fighting make occur between males even when the enclosure is quite large. To house one bearded dragon, the enclosure size should be 180 cm long x 45 cm width x 40 cm in height. Whenever another bearded dragon is added, the floor area of the enclosure needs to increase by 0.36 square cm for each bearded dragon. However, the larger the housing, the better it is for them. The more Bearded dragons that you have, the more requirement there is for multiple basking lights, feeding stations, spectrum lights. If there is not enough of these, then the weaker bearded dragons of the group will suffer because of this. The best type of enclosure for a bearded dragon is called a vivarium. These can be purchased from a pet store or constructed at home. A large aquarium will also suffice, but access to the bearded dragons will have to be from the top. The difference with a vivarium is that the have access doors on the side of the enclosure which is really helpful in accessing the bearded dragons. If you are planning to make a vivarium, then use materials that are non-absorbent and that can be cleaned easily. Melamine-faced wood and glass can be used to make them. However, they do have a lifespan that is quite limited as they are not as easily cleaned as commercially purchased vivariums. Vivariums that are sold in stores are usually lightweight with rounded corners that can be easily cleaned. They have ventilation grids and places to fit lights and heaters. Choosing the best place for a vivarium is something that needs good consideration. The kitchen. Avoid anywhere where food is prepared as their may by faecal contamination when handling a bearded dragon. Where there is direct sunlight. The vivarium will become like a greenhouse and the bearded dragon will suffer inside it because it will trap the sun’s rays. The best place to put an enclosure for a bearded dragon is the room in your house which is the warmest and most insulated. This is so as to reduce the variability in the ambient temperature. The lower the ambient temperature that is surrounding the enclosure, the more difficult it is to achieve the correct temperature inside it. The temperature should range from 77 to 86 degrees farenheit. It should have a basking site temperature of between 86 to 95 degrees farenheit. The temperature should be between 68 to 71.6 degrees farenheit. After setting up the enclosure, the temperature needs to be monitored closely. In order to do this, use a thermometer to help record the minimum and maximum temperatures. What heat sources should I use for my bearded dragon? What you need from a basking light, is that it radiates heat. This can be an incandescent light bulb or a special heating bulb, such as a ceramic heater. A basking light should be positioned at one end of the enclosure to help provide a temperature gradient within the enclosure. The basking lights should be positioned at a high point in the enclosure. The bearded dragon will respond to a heat source from above and will want to climb up towards it as they will use the heat that is transmitted to optimize their body temperature. The basking light should be positioned at one end which will be the hot end. The height of the lamp should be varied to get the required temperature for the basking area which is between 86 to 95 degrees Fahrenheit. As you can imagine, the light can get very hot and so if it is in reach of the bearded dragon, it needs to be surrounded by a guard to prevent it from getting burnt. Then measure the temperature range from the hot end to the cold end. This range should differ from 86 to 77 degrees farenheit. Place a dark rock that has a flat area on its top under the basking light. It will warm up quickly and provide an additional ventral heat pad for the bearded dragon. A large log can also do the same job, if you can’t find a dark rock. The bearded dragon will climb up on the rock to optimize its body temperature. They ewill thermo-regulate instinctively when responding to raditated heat from above and so do not have any use for a hot rock. Additional heat sources can also be used to help get the enclosure up to the required temperature range of between 86 to 95 degrees farenheit. The best way to do this is to use a heat mat which can be placed underneath the enclosure. This needs to be insulated from the ground, or the work surface on which the enclosure is placed so that the heat travels up. The heat mat can also be placed on the sides of the enclosure if it is pressed up against cold walls. © 2019 onlinebeardeddragoncare.com - All rights reserved.